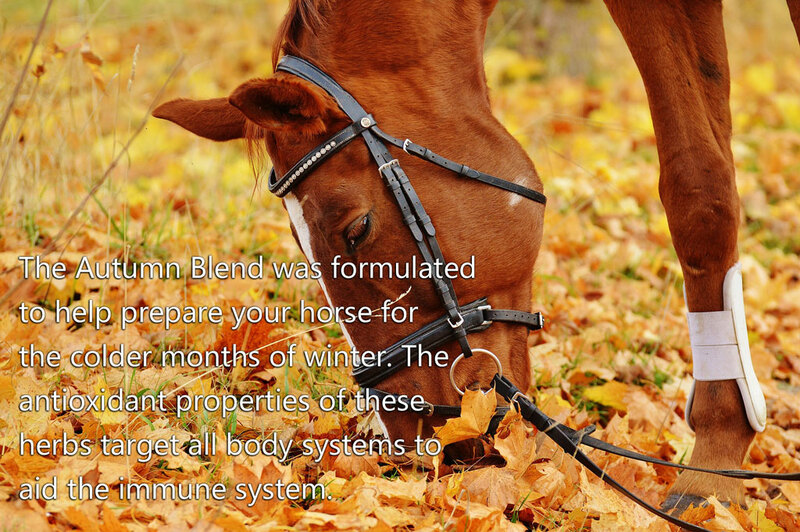 The Autumn Blend was formulated to help prepare your horse for the colder months of winter. The antioxidant properties of these herbs target all body systems to aid the immune system. 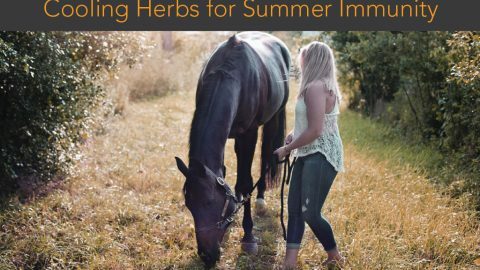 During the Equine Flu outbreak in 2007, it was a valuable combination of herbs to assist horses with their recovery and continues to ward off debility and lethargy, especially after the hot Summers we have in Australia. Echinacea Leaf to increase the body’s resistance to infection North American India used this plant to treat many equine ailments including snake bites, septicemia, fevers and hydrophobia. It is a good herb in assisting your horse to overcome any viral or bacterial infections. Echinacea is helpful to encourage wound healing internally and externally and helpful also in clearing up skin problems. Although Echinacea is effective with both bacterial and viral infections anywhere in the body, it is particularly helpful in upper respiratory infections that our horses are prone to with the change of season. Licorice Root as a general tonic Historically known as the harmoniser, licorice was added to assist with balancing the immune system helping also to reduce toxins and inflammation. Its anti-depressant effects help with the shortening daytime light during Autumn and as a tonic for the whole body helping to balance the endocrine, nervous and immune systems. Licorice is an expectorant and demulcent herb helping with mucous from the lungs and bronchial tubes. As further support in recovering after an illness it supports the liver assisting the body to rebalance from prolonged steroid or phenylbutazone use. Peppermint Leafto regulate the body’s temperature The addition of peppermint to the blend helps clear the head of congestions, stimulates circulation, acts as a mild settler to the stomach assisting with digestion. It is used as anervine tonic, easing anxiety tension and hysteria, and the amount in the Autumn Blend has an all over body calming effect. Historically used as a cooling herb for colds, flus and fevers. As a tonic herb it helps to recharge vital energy and dispel lethargy, chronic illness and aids in convalescence. 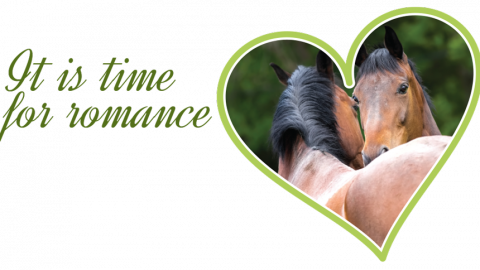 For your stallion preparing for the season it may bean aphrodisiac tonic. Rosehips high in Vitamin C to fight mild infections As one of the best sources of vitamin C Rosehips aid in general debility. This herb helps with body condition and fighting off infections and restores immune defences. It is a quiet achiever working as a support herb to the ones that often take the credit for resolving an issue. As an overall tonic it brightens a dull coat and promotes hoof growth. In the Autumn blend rosehipsis supplementary as in its own action fights mild infections, particularly those causing snotty noses; and assists with gastric inflammations and diarrhoea. Parsley rich in Vitamin C and iron to help eliminate waste from the body Parsley leaf was added to assist with depressed digestive processes due to its usefulness as a dietary supplement. 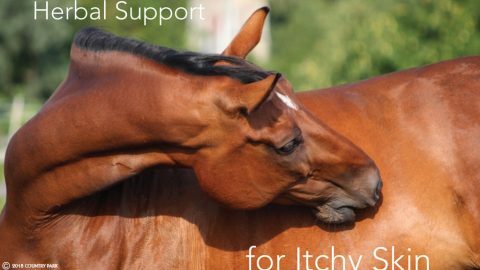 It is highly nutritive and can be used for building and restoring strength, especially if your horse has had anaemia from being sick or poor quality summer feed. It can also settle a stomach with its carminative properties. St. Mary’s Thistle contains silymarin to support the liver St Marys Thistle is best known as a liver tonic and protects the liver. A happy liver helps manage the flow of toxins in the body so that it does not become clogged and congested. In Chinese medicine the liver keeps tendons and ligaments moving healthily. Asmany equestrian sports compete regularly in the cooler weather, the inclusion of this important liver herb helps support the elimination of toxins from exertion as well as with elasticity and integrity of connective tissue. Overall the Autumn Blend is designed to assist with the transition from the heat of Summer to the cold of Winter; to ward off many respiratory infections, strengthen the body’s immune system and aid with the increase of work as riders begin to get out and about with the change of season. Disclaimer: The information provided in this article is for educational purpose only and is not meant to replace veterinary advice or treatment. Copyright: Catherine Bird, who is also the author of a Healthy Horse the Natural Way, has been an equine natural therapist for 27 years working closely with Country Park Animal Herbs for over 13 years offering advice to their clients.